Andbank Microfinance Fund has two philanthropic aims; one is to invest in socially responsible assets and the other to allocate 80% of its profits to one or several selected NGOs. The fund will donate close on 24,000 euro to the FERO Foundation, so that Andbank will be actively supporting the Foundation’s cancer research programme. Andorra, 15 March 2018. Andbank, a specialist private banking entity, is donating the dividends from Andbank Microfinance Fund to the FERO Foundation, for an amount of 23,678.03 euro (28,363.72 dollars originally). The fixed income fund invests in microcredits to developing countries promoted in collaboration with BlueOrchard. 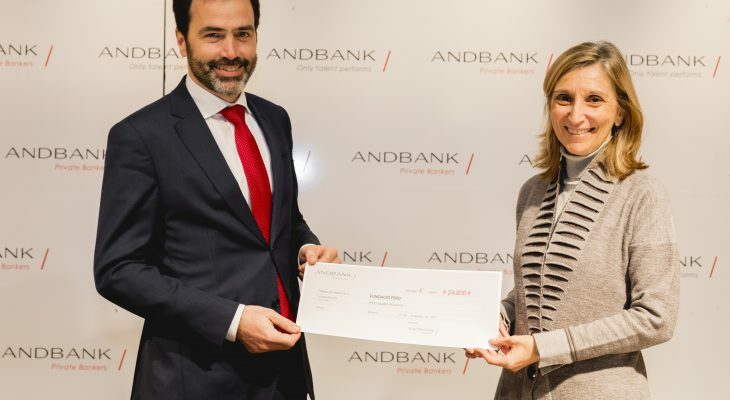 The cheque was presented at an occasion attended by Piru Cantarell, director of the FERO Foundation, a private foundation dedicated to cancer research, and Pedro Pueyo, Head of Global Operations of Andbank Asset Management, a subsidiary of Andbank. Andbank Microfinance Fund has two philanthropic aims; one is to invest in socially responsible assets, such as microcredits to entrepreneurs in developing countries, and the other is to allocate 80% of its profits to projects being developed by selected NGOs, while the remaining 20% is shared among the equity holders. The product comes under the umbrella of the BlueOrchard Microfinance Fund, a fixed income fund that has been going for more than 15 years and has an average annual profitability of 4%, in which either dollars or euro can be invested. BlueOrchard is one of the biggest names in socially responsible investment at world level, promoting financial inclusion and sustainable growth through investment and financing solutions for financial institutions in developing countries. It was founded in 2001 on an initiative from the United Nations with the aim of encouraging financial inclusion. The fund manager offers loans in exchange for defining exactly which type of person is being financed, establishing accessible interest rates. Up till today, 139 loans have been granted to microcredit institutions, to microenterprises in 39 countries, among which 54% are run by women and 50% are rural microenterprises. For all this management activity, BlueOrchard works with more than 80 local institutions which it constantly audits and monitors. In parallel, it has its own research team and tools with strong risk management. Pedro Pueyo of Andbank says, “this product is a good fund for philanthropic investment. We are convinced that socially responsible investments will have more and more importance in the sector. At Andbank we are working in management to ensure that every year more dividends can be allocated to the NGOs for which they are intended”. The FERO Foundation is a private foundation devoted to cancer research. Thanks to finance from private donations, it has been able to start up numerous laboratories for scientific research. It was founded by Dr. Josep Baselga, professor of medicine at Barcelona Autonomous University and president of the VHIO (Vall d’Hebrón Institute of Oncology) Foundation scientific committee. One of the Foundation’s principal achievements has been creating the Breast Cancer Center at Vall d’Hebrón, unique in its specialisation in Spain.